This colorful, fully detached holiday home, a former 17th century farmhouse with a beautiful enclosed front lawn, is situated in picturesque Les Guillans. In the back garden, you will find a large tiled terrace with garden furniture, sunbeds and a barbecue. There is also an enclosed pond (60 cm deep). Adults and children alike will find plenty of things to do in this amazing house. Take a splash in the portable pool in July and August. Or enjoy a game of table tennis. It is incredibly relaxing in the hot tub (fee charged). 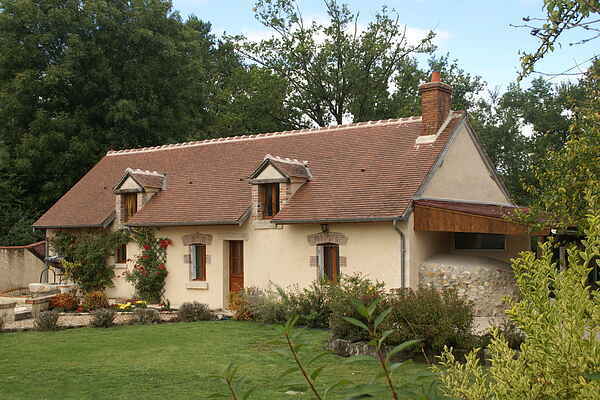 A tennis court, bakery, grocer and several restaurants can be found in Coullons (6km). The forests surrounding Les Guillans are perfect for long walks and great mountain biking. The beautiful Château de Senteurs is found in Blancafort (5km). Its park and gardens covering more than 20 hectares is definitely worth the trip. Just a bit further, on the banks of the beautiful Loire, lies the charming town of Sully-sur-Loire (21km). Here you can again admire a marvelous castle. In its illustrious history, it was even admired by the likes of Lodewijk XIV. Later, it captured the affection of the philosopher Voltaire. In the south lies the town of Sancerre (40km), home of the exquisite, world famous Sancerre wine. Activities such as paddle boating and surfing can be found in Etang du Puit (12km).